That’s my son for you. Let’s begin with some irony – Phineas Taylor Barnum never actually uttered the phrase, “There’s a sucker born every minute.” So we suckers have come to believe that he did – and even use it to titles of blog posts about his honorary museum! My head spins! The phrase was actually uttered by David Hannum, spoken in reference to Barnum’s part in the Cardiff Giant hoax – which we’ll learn more about later. 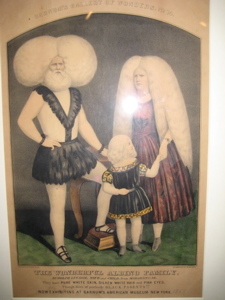 Hannum, who was exhibiting the original giant and had sued Barnum unsuccessfully for exhibiting a copy and claiming it was the original, was referring to the crowds continuing to pay to see Barnum’s exhibit even after both it and the original had been proven to be fakes. Rest assured, this museum is the real deal. It is, in fact, one of the coolest and oldest museums in the state. I had the good fortune of visiting with friends Rob and Yvonne as part of our day long MegaQuest in the region. The building itself is sort of a museum in its own right; it was was originally contracted for construction by P. T. Barnum himself. 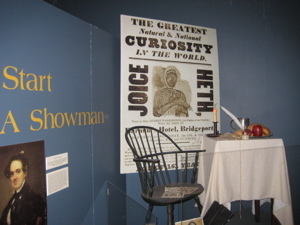 The funds and land for the building and museum were provided by Barnum to house the work of the Bridgeport Scientific Society and the Fairfield County Historical Society. The structure was completed in 1893 and is home to The Barnum Museum today. 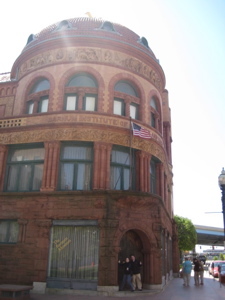 The three story museum in downtown Bridgeport is constructed of stone and terra cotta with architectural influences ranging from Byzantine to Romanesque architecture. Relief panels lining the top of the building contain imagery from America’s history including Native American, maritime, Civil War and industrial age reliefs. There are also busts interspersed among the relief panels of a Native American, Christopher Columbus, George Washington, Elias Howe, Civil War General Winfield Scott and Grover Cleveland. Grover Cleveland? Random. Barnum bequeathed $100K to the city of Bridgeport for this place. 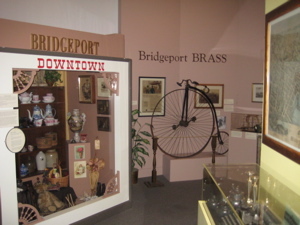 The building is divided today into the Barnum-the-man section, a history of Bridgeport, and a history of the circus Barnum is famous for today. There is another large wing of the place that I couldn’t quite figure out, but it seems to be a place for school trips to do large-scale projects and talks. 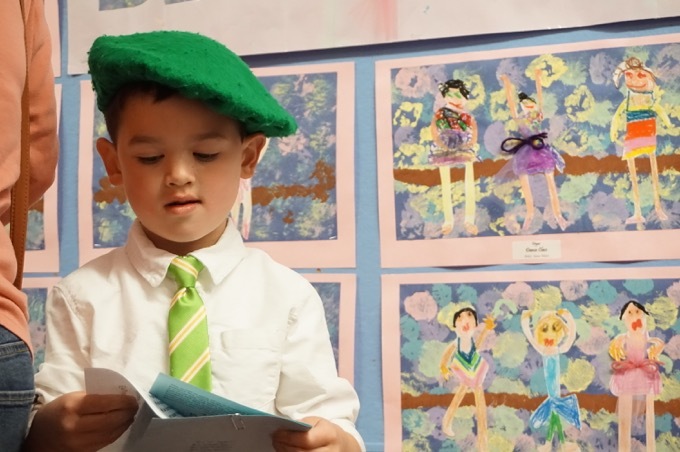 Oddly, there was an exhibit entitled “Art Inspired by Amy Tan’s The Joy Luck Club” for some reason. As I now approach the part of my write-up where I get to the core of the museum, I feel sort of silly. It has been four months since my visit and the amount of information on the Interwebs about Barnum and this museum is massive. I really don’t feel I can add anything of much worth (as opposed to what I provide on the more obscure places I visit), but I shall try. On January 1, 1842,…, opened his American Museum on lower Broadway in New York City. Promoting the Museum as a place for family entertainment, enlightenment and instructive amusement, Barnum’s American Museum became a shrine for advancing public knowledge of fine arts, music, literature and the marvels of nature, showcasing natural curiosities alongside artistic and historic exhibitions. Barnum’s American Museum quickly became the cultural hub of New York, claiming its place as the city’s most popular attraction for 23 years. From 1842 until 1865, the American Museum grew into an enormous enterprise, and was promoted as having 850,000 exhibits and curiosities throughout the saloons… Barnum offered a chance to explore the irrational, examine imaginative possibilities, and derive opinions and truths. Even for P.T. 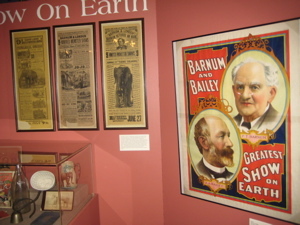 Barnum, the American Museum was only the beginning of a lifetime of extraordinary adventure and acquisition of immense personal knowledge and fame. Some cool stuff this essay left out – which the museum does not – are things from his old NYC museum. One of his first scams was Joice Heth, an rather weathered black lady billed as being 161 years old. Barnum found her and bought her as a slave in 1835 and toured the toothless, blind, partially paralyzed woman in New York. Even though coroners said she was only in her early eighties, I choose to believe Barnum. 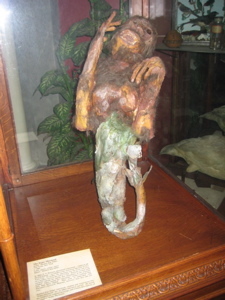 Just like this little guy pictured here really is a mermaid from Fiji. The “experts” claim it is just a monkey head sewed onto a fish body. Pffttt, what do they know? There is so much more to absorb here – only on the first floor! 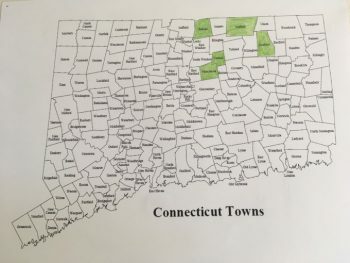 The Connecticut Giantess! Cheng and Eng the Siamese Twins! The Wonderful Albino Family! A mammoth fat girl! On and on… Great stuff. Unfortunately, Barnum’s massive museums in New York kept burning down causing him much person emotional and financial loss. After the last devastating fire in 1868, Barnum decided to retire. Well, in a way, he “made” Bridgeport. Of course, I don’t think he’d be proud of his adopted home town today. While it’s the most populous city in the state, it is easily one of the most crime-ridden, dilapidated, illiterate and poorest as well. While the museum is plopped in a “nice” downtown area (right next to the highway), I wouldn’t recommend walking too far afield from it. Anyway, I’m sure it was a much different place in 1875 when Barnum became Mayor! And he wasn’t just another famous person who was elected due to name recognition – the man made things happen! He improved the water supply, added gas lighting on the streets, and reduced violent crime significantly. 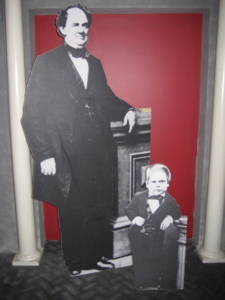 A huge proponent of abolitionism and the abolishment of the railroad monopolies, Barnum also served two terms in the state Legislature. Wow, this is a comprehensive museum! The second floor exhibit is called “Art & Industry: Age of The New Deal Exhibit” and it is pretty expansive. 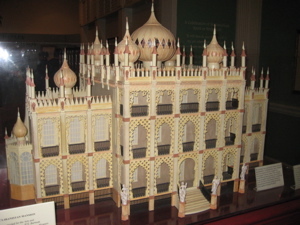 I learned that Barnum’s massive mansion was called Iranistan and was down near Seaside park (CTMQ visit here!). 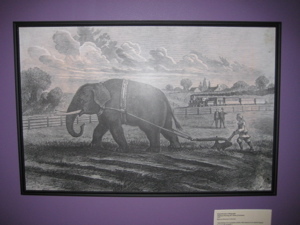 Randomly, Barnum also used to have traditionally dressed guys plowing fields near the train tracks with elephants, merely to spark curiosity about Bridgeport. Now that’s cool. There are lots of displays about particular Bridgeport businesses that once thrived and a section about New Deal public art. 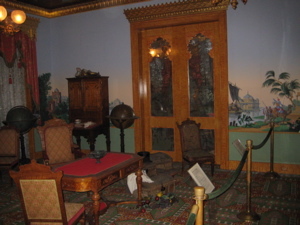 There is a Jenny Lind room devoted to the “greatest singer in the world” whom Barnum brought over to the States for a stint. You can read all about this museum section here, because my report is too long already. 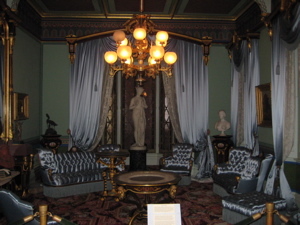 The third floor is dedicated to the circus that Barnum made famous. 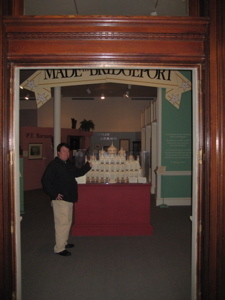 Actually, the exhibit is about Bridgeport’s Barnum Festival – which I’ll let them explain: “The Barnum Festival is committed to Bridgeport’s history and it is through P.T. Barnum’s altruistic legacy that the Festival phenomenon prevails today. The Barnum Festival has been in constant operation for 58 years as a community service organization, and it is the intention of the exhibition, Come One, Come All! to enshrine the vibrant history of this extraordinary Bridgeport institution, and open the doors for the community to engage, reflect, and delight over the stories and memorabilia of past Festival years, and to celebrate and partake in the festivities of this years line-up of captivating events. It certainly does that – it also gives the feeling of a circus through its massive diorama and circus history. 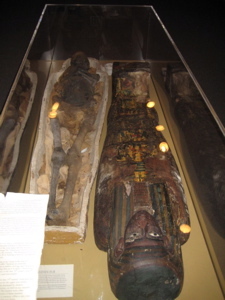 Also hidden away up on the third floor is a mummy. And the most amazing thing about it is – it’s actually real! This very un-Barnum-like artifact is named Pa-Ib. Thought to be male for a century, recent CAT-SCANS have shown her to be a she. 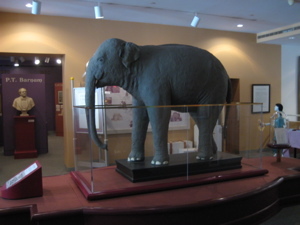 She was given to the museum by Barnum’s second wife in 1896 and she lived in Egypt about 2500 years ago. The funny thing about Pa-Ib is that they sort of hide her away… even though she’s pretty much the only legit thing Barnum showcased. I guess that makes sense somehow. 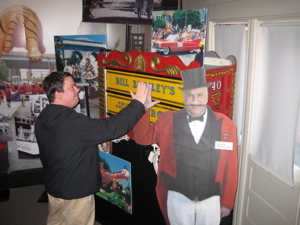 The Barnum Museum is great; it is large, thorough, fun and varied. From the unique building itself (Next time you drive on I-95 through Bridgeport Look off to the west side and you’ll see the reddish, vaguely middle eastern looking turret) to the unique man it celebrates, this museum is certainly one to be sure to visit. 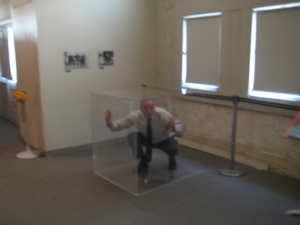 The Amazing Man In a Box! This was a really impressive museum, a lot of interesting stuff.